and promotes locally made products. SACRAMENTO, CALIF., October 2, 2018 -- Sac-Made announced today that it is now accepting applications from Sacramento region-based makers and manufacturers for inclusion in the public-access online directory on its website. The website will help consumers identify and purchase products from Sacramento makers and makers and manufacturers spread awareness of their products to assist with sales and partnerships. Sac-Made is the brainchild of Eric Ullrich and Trisha Rhomberg, owner of Old Gold, a vintage and handmade goods shop in the Warehouse Artist Lofts’ Public Market; and Sarah Barkawi, VP of marketing at Fulcrum Properties. The team received a $25,000 grant last November from the City of Sacramento’s Creative Economy Pilot project to launch the program. “Our maker creative community is in full bloom, and Sac-Made is an opportunity to further expand their role in building a strong base of support for local products that are uniquely Sacramento,” said City of Sacramento Vice Mayor Steve Hansen who has been actively supporting the maker community since he took office in 2012. The mission of Sac-Made is to “celebrate local” by connecting Sacramento’s makers, manufacturers, artisans, and creatives by building relationships within the community, growing awareness of local makers, and providing opportunities for entrepreneurial growth. “By building an accessible platform to find your local maker, we narrow the gap between artist and consumer – creating tangible ways in which to celebrate our city’s unique cultural and creative identity,” said Rhomberg. In addition to launching its website, Sac-Made is introducing its brand at the Holiday Makers Mart in Sacramento on December 8. Makers Mart is a curated, handmade shopping event that features items crafted by local creatives including home goods, clothing, jewelry, and more. To be included in the online directory, makers and manufacturers are encouraged to apply now. “Sac-Made was created to bring awareness and support to local makers and manufacturers,” said Ullrich. “By submitting an application, creatives will gain representation in our local economy through an impact report that will support the development of additional resources to help them start or grow their maker businesses." To be eligible, applicants must be headquartered in Sacramento and/or have a registered business license in Sacramento, design and manufacture a physical product in Sacramento, have a Sacramento-based workforce with the desire to grow over time, and have the equivalent of one full-time employee (for example, a sole proprietor). Established in 2018, through seed funding from a City of Sacramento Creative Economy grant, Sac-Made connects Sacramento’s diverse artists, makers, craftsmen, and creatives by building relationships within the community, growing awareness of local makers, and providing opportunities for entrepreneurial growth. By building an accessible platform to find local maker, we narrow the gap between artist and consumer – creating tangible ways in which to celebrate our city’s unique cultural and creative identity. For more information, visit the Sac-Made website at www.sacmade.org. 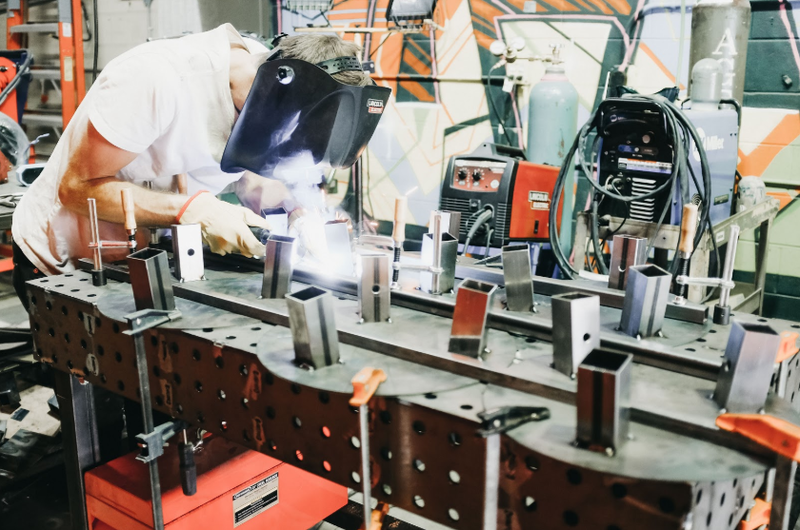 Photo caption: Craftsman Trent Dean fulfills client orders for custom furniture at the Hacker Lab metal shop.